I truly appreciate all four seasons: I love a hot summer, crisp fall, cozy winter and breezy spring. Chicagoans love to complain about the cold, which, if you ask me, is because it’s expected of them since it’s not so cold (unless we’re having a polar vortex) that you need to mention it every time you are introducing yourself to someone, as in, “Hi, I’m so and so from Chicago where it’s really nice—as long as you don’t mind the cold! Me, I don’t really care if it’s cold, even really cold, because I love the sweaters and parkas that go along with snappy temperatures. (I’m also a homebody who will use any excuse to be under the covers.) I have lived with cold winters my whole life (Michigan, NYC, Chicago) and I know people who reside in Texas and Miami and other warm locations who pine for the occasional sweater. Unfortunately, the last couple of seasons were a bit of a bore in terms of knitwear. I found this fun Markus Lupfer sweater last year and that was about it. No pretty ski sweaters like this season. No well-padded second skin with swingy fringe. Nothing. Nada. Zip. (Perhaps designers had a crystal fashion ball telling them it would be 70 degrees in February. See what I mean about winter in Chicago?) 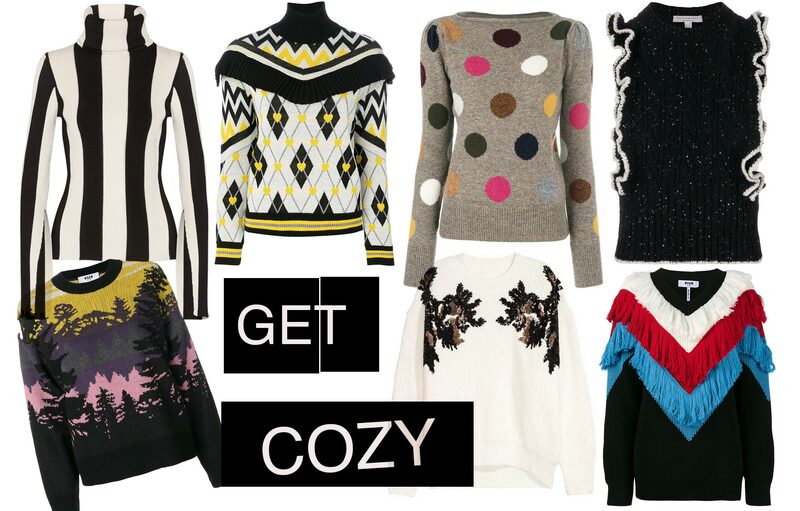 Thankfully, they braced for the cold this year and I have my eye on piles of pretty sweaters. Take a look. Sweater weather can’t come fast enough.